Okay first of all I need to give a major shoutout to The Good Wife. After hearing so many people (especially ladies who host feminist podcasts) recommend it, I finally gave the show a go last week and have not looked back since. It's full of powerful female characters, interesting court cases and lots of sitting in the living room by myself yelling "YES, ALICIA!" at the TV. Watch it. 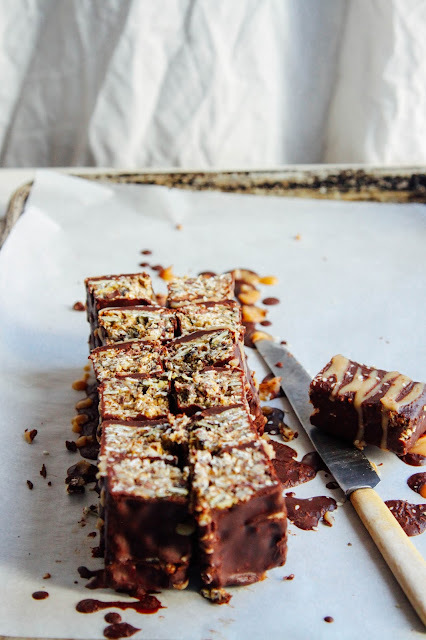 Moving on: these bars were inspired by Chocolate Mint Builder's Bars, although they turned out way better. Heh heh. Here's the story: I've gotten into heavy weightlifting over the past year and although my dedication to it has not been totally consistent, I'm pretty into it at the moment. I love feeling my muscles getting stronger and my body more capable, I love waking up the morning after a killer workout and experiencing soreness all over. I love the kind of hunger that comes with regular exercise, it's like this instinctual knowledge that I need to eat more to refuel my bod. I won't go to deeply into the protein myth of veganism because it's ancient by now, but decades of debate summarized: getting enough protein on a vegan diet is possible and very do-able, in fact a lot of vegan folks don't even have to think about it. But for people who are doing intense weight training or other exercise regularly, it might be a good idea to increase their protein intake (and their caloric intake in general). 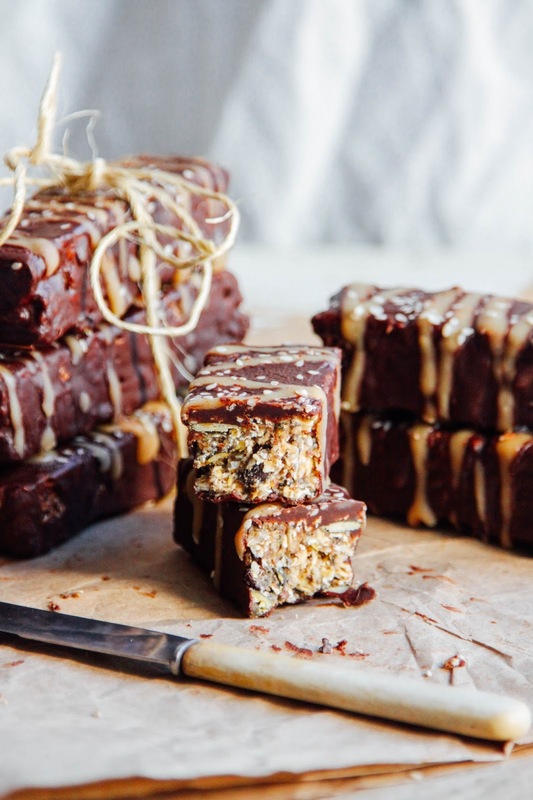 The point of me saying all this is to make clear that I'm not sharing a vegan protein bar recipe because vegans getting enough protein is a dramatic and constant struggle (it's not, for most of us). 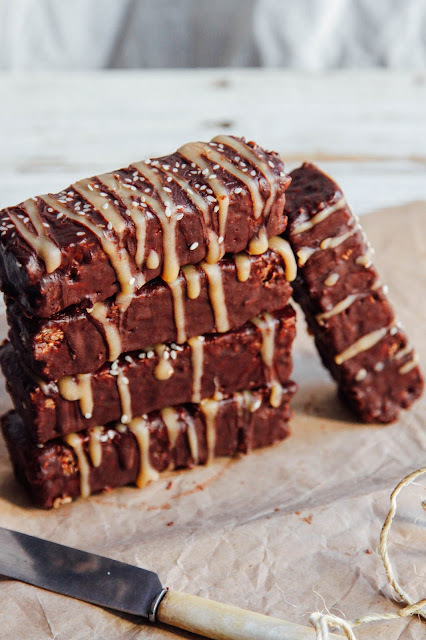 I am sharing it because I go to the gym 4-5 days per week and need to replenish the calories (protein, fats and carbs) I use up, so these power bars come in handy. And like I said, I made them because I wanted to come up with a more affordable, wholesome and less packaged version of Builder's Bars. I loooove Builder's Bars, they taste so good after a tough workout and are basically just protein-rich vegan chocolate bars. But the ingredients are really refined and I'm not into the packaging or price. Ideally I want to eat one everyday but it just doesn't seem like a sustainable routine; I'd rather make my own. And so... voila. These homemade power bars are full of healthy fats and proteins from seeds, nuts, coconut and oats; and energy-giving carbs from dried fruits. They taste great and are the perfect food to refuel fast after I'm done at the gym. They are quite rich and dense so cutting them in half might be a good idea before you chow down. At the same time, I'm not the food police. Eat as much as you want... and eat them anytime! You don't have to do exercise to be deserving of delicious food. Note: I just did a lil calculating on cronometer.com and figured out that each bar (if you end up with 7 bars) has: 40% of your RDI for Omega 6's, 21% of your proteins, 46% of your vitamin K, 16% of your vitamin E, 23% of your vitamin B1, 21% of your vitamin B2, 24% of your iron, 65% of your manganese, 43% of your magnesium, 52% of your fibre, and more good stuff on top of all that. Score. 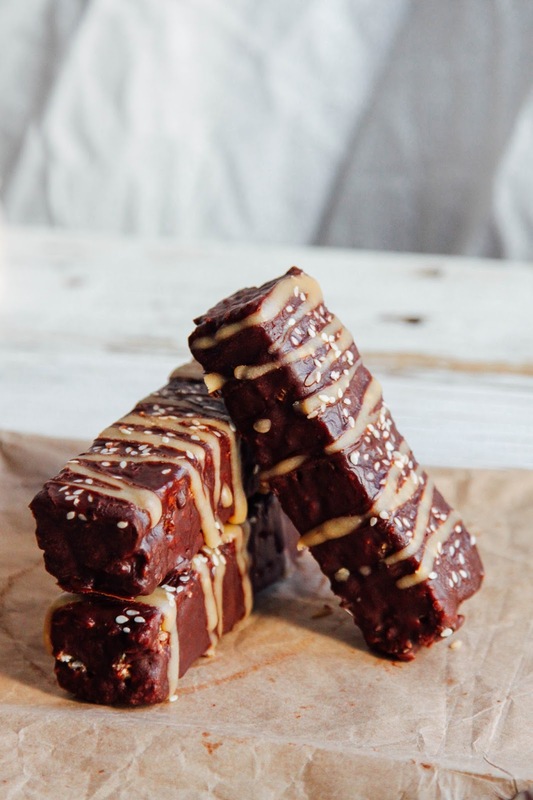 To make the bars: blend the lemon juice, dates, almond butter, salt, raisins, vanilla, coconut oil and water into a thick caramel-like mixture. Throw all the dry ingredients (seeds, oats and cacao nibs) into a large bowl. Scoop the caramel mixture into the dry ingredients and mix in until you have a sticky mass that holds its shape and doesn't crumble. Essentially you're using the caramel mixture to bind together the dry ingredients. Press into a lined standard bread loaf pan and let sit in the freezer for at least a couple hours or until solid. Once solid, slice into bars or squares (whatever you like). To make the chocolate: melt the coconut oil then stir the other ingredients into it until you have liquid mint chocolate. 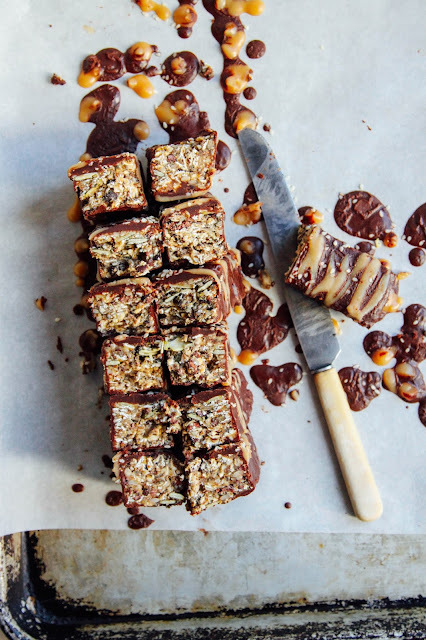 Dip the solid bars into the chocolate and set them on a cooling rack or lined backing pan, then pour the remaining chocolate over the bars so they are double coated. Leave in the fridge or freezer to harden the chocolate while you make the baobab drizzle. To make the drizzle: melt the coconut oil then stir in the rest of the ingredients, it ends up looking like caramel! Drizzle over your chocolate-coated bars and put in the fridge overnight. Enjoy! I'm with Sarah - the perfect post gym snack indeed! These look great! These sound really good! I always pound down a Pro Bar after snowboarding - because working out makes me SO hungry!! When you say a cup of dates, do you cram and pack them in there or just loosely put them in? These look amazing!!! What could you substitute for the Baobab Powder? 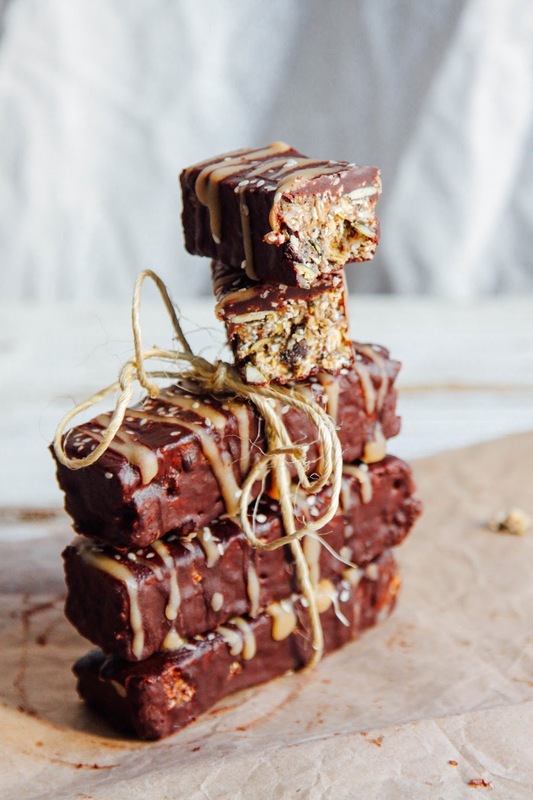 Oh my gosh Emily, these look incredible! I'm also a big fan of Builder Bars but not a fan of the price so I'll definitely be giving these a try! We made these bars over the weekend and oh. my. gosh. They are incredible. It was hard not to eat them all at once! These are SO good! I've made them 3x over the last couple months but left off the Baobob drizzle...where do you buy this fruit powder?